It’s funny how The More Things Change – The More Things Stay the Same. Each Spring over the past 10+ years or so, we’ve come to anticipate the season bringing temperamental conditions in the form of runny noses, growth spurts, limit testing- even the weather may fluctuate from one extreme to the other. If you’ve been around a few years, you learn to stay just slightly ahead of the tide. You’ll find our faculty meetings packed with reminders for health and sanitation best practices, if/when/how to apply bug spray or sunscreen, and curriculum enhancements to address growing needs. We’ve even come up with a plan on how to set the thermostat, when to open or close windows, and a communications protocol so that the entire school is able to respond to the center’s HVAC needs during days which begin in the upper 50s (10 C) and end in the mid 80s (27 C). And each year we know where to go when making that call – the Infant Room. While social cohesion, collaboration, self-regulation (a strong indicator for academic success) and free movement are integral components comprising our school value system- the child’s capability across the varying planes of development from infancy to Kindergarden age varies widely. Our obligation as a center lies in meeting these varying needs at the weakest- or rather- most fragile level providing the necessary infrastructure to allow the child to feel supported and competent as she works towards independence and mastery. In regards to being able to regulate body temperature- we look to our babies in determining if/when/how to close up the doors and set the thermostat. You might think it strange that we spend so much time and energy contemplating turning on the AC – it would be much easier just to set the thermostat and move on. While we recognize that being in the Deep South of the United States we will ultimately be relegated to the climate controlled indoors with internmittant access to the outside, we also recognize that once so, our children will break connections with each other, with their self motivation, and with nature. Once we plug into the AC the doors shut- children lose their ability to connect visually, verbally and physically with adjacent communities involving older friends and siblings. Prior to door closing movement and cognition intertwined- now free movement is more restricted usually resulting in the outdoors being a place for gross motor activity while the indoors one for controlled movements in sensitivity to the group. Reluctantly, a bird’s song, the smell of approaching rain, and soft Spring breeze is replaced with the hum of an air conditioner switching on and off. This time of year- we’re sweating it as we balance the needs of our entire school community with that of our youngest members. When things heat up in the infant room, it’s no small matter. Overheating an infant may increase the risk for SIDS. “Keep a room at a temperature that is comfortable for you” can be debatable in a child care center where we all have varying opinions on what is comfortable. You would have to keep the temperature set at 80 for me and I would still need a sweatshirt because I am always cold. The various websites all give somewhat conflicting recommendations. It appears you are already doing what most recommend and as I recall from my visit, the children sleep with very light clothing. Of course, it’s nice when your policies are within recommended guidelines- however, being with babies means that we have to surpass stated standards, constantly evaluating center practice and the well-bing of each child keeping in mind that an infant’s needs can often be quite different than the adult’s- even with something as basic and temperature control. Anna Tardos, Director of the Pikler Institute (an orphanage in Budapest), reminds us that when you are assessing your practice- first and foremost- look at the child. On that particular day, we were also taking a moment for photographic documentation- here is what we saw the children doing. The thermostat hung between 78-80 while a breeze blew through the open solarium door. Several times during my observation of the Infant Environment between 2:15pm-4:00pm that day I was able to reach out in gesture or smile- at times, I connected physically with the babies. What was I looking for? An infant’s skin should feel cool to the touch (not clammy), appear content and peaceful, and should be actively exploring the environment. Without looking at a control panel, I was able to assess if the temperature was comfortable and safe for the babies in our care. Still, the relationship of a baby being overheated in question of an increase risk to SIDS lingered, so we dug a little deeper. So what is our balance at Little Learners Lodge? Currently, we’re checking our thermostat for accuracy…. and in the meantime, it’s set to a cozy 78 Fahrenheit. Until the AC kicks on we’ll all enjoy our outdoor access the sights, sounds and smells of nature and our school community. We’ll remind ourselves to dress children for the weather – teachers, too- offering refreshing water breaks periodically. During sleep, we’ll keep our rest items minimal- a light blanket at most and make sure the fans are on to assist with air circulation. We’re also on the hunt for vinyl strips (like they use in warehouses) for doorways in order that the children can pass through to the outdoors while keep the cool air in. Seen any? 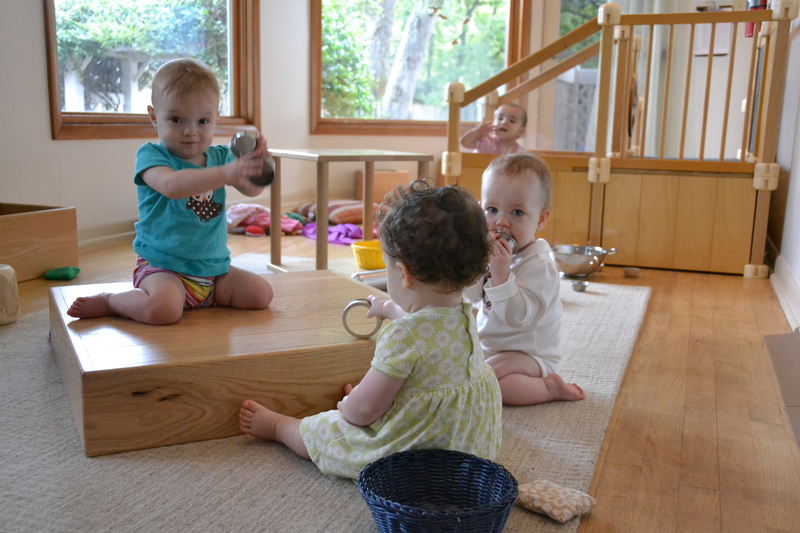 Recently a friend referred to our childcare center as an intentional community model. Unfamiliar with the term, I soon discovered intentional communities are planned communities defined by teamwork encompassing a group of people sharing a common vision or ideal. A respectful beginning is an investment in the future of the relationship between your child and you, your child and others, and in your child’s exploration of the world. A RIE beginning helps to develop a competent, confident child. Irregardless of where your children attend preschool or where you choose to make your childcare profession- adults caring for children invest significant time, resources, and preschool dollars towards the endeavor. According to the National Association for the Education of Young Children (NAEYC), financing early childhood care averaged $11,500 annually- and that was in the mid 1990s. 1. Define your family value system- identify the characteristics of the people you would like to see involved with your family. Young children absorb the attitudes and culture of the adults around them; what would you like these attributes to be? Are these traits congruent over time? In other words, what kind of person do you see your child as a young adult and can these attributes translate in what we provide him at infancy? 2. Research opposing view points and find the one that fits best with your individual family parenting style- does one approach advocate scheduled feedings and another not? What do you feel is “right” for your baby? Avoid asking friends and family for their advise at this juncture as it tends to cloud your own investigation as this will afford a baseline for later evaluation. 3. Tour and observe a multitude of childcare facilities even if you think you already know where you would like your child to go- you may be surprised by what you discover. Use your value system and research to drive your query on how the center implements theory into practice; recruits, trains and supports caregivers; and involves parents as a community. 4. Ask about the leadership and future vision of the centers you are considering- knowing how a school is planning for the care and well-bing of its program in the next three, five, and even ten years will allow an understanding on how the program manages its resources. The management of a preschool’s resources either in securing equipment, providing for teachers, or enhancing curriculum offerings will affect your child’s experience and is also a way to better gauge likemindedness between school leadership and parent values. 5. How are parents connected with school life? A multitude of opportunities exist to connect families with what is going on with your child during her preschool hours. What measures are in place to keep parents informed on child development, in communication with their teachers, connected as a community, or involved during the day? 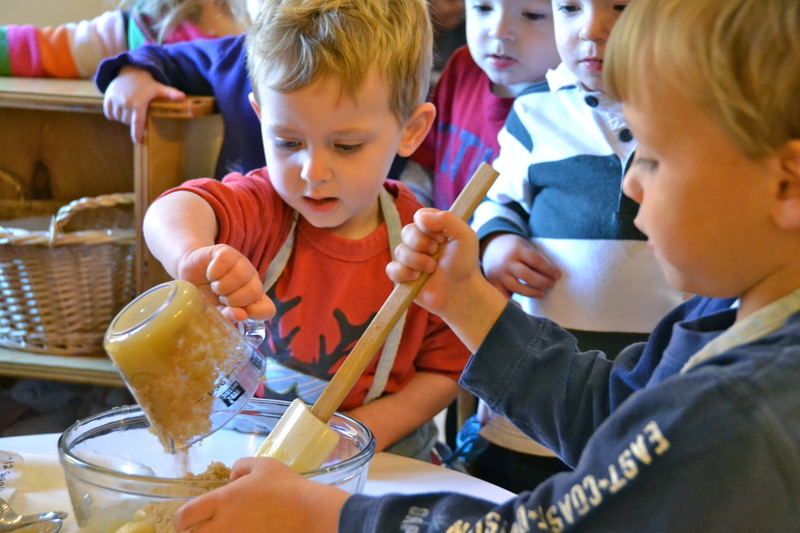 It’s helpful to ask prospective preschools why they chose the activities in place and how it enhances their preschool offering. 6. Ask to see a copy of the Parent Handbook prior to registering your child- It is impossible to gather all of the information necessary to ensure you are making the wisest longterm decision for your child in a few short meetings or one observation. Understanding the policies and procedures you will be asked to adhere to as a member of the school community before you register or enroll your child will assist the communication process. 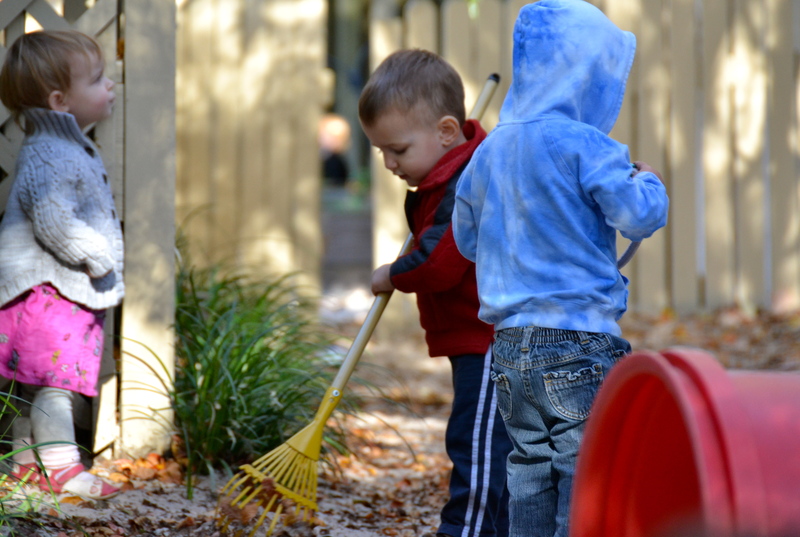 Children do not separate where they learn and play during their absorbent period of learning (the preschool years). Parents are THE primary source of a child’s learning during early childhood, which is why it is critical that preschool offerings are consistent with home expectations. Otherwise, your child will not be secure in his knowledge of what is expected at home OR at school. The result? Well, children are wired to test the limits in order to internalize expectations. Which means, when school and home life are drastically different, a child will TEST LIMITS at both home and school until she reaches a certainty on understanding “the rules.” This is trying for both parents and teachers and in some ways, is throwing your investment out the door. When choosing a preschool that represents your family core value system, do it with intent. Current research supports It All Starts Here. When one observes closely a baby being diapered the RIE way the idea that interchange could support early literacy takes root. Did RIE Founder Magda Gerber see this correlation between reading readiness and diapering? Taking a look at Magda’s segment on the topic in her book Your Self Confident Baby: How to Encourage Your Child’s Natural Abilities- from the very start one gets a feel for her ideals in regards to importance of diapering. She often reminded us that a baby gets a diaper change six or seven THOUSAND times from birth until she learns to use the toilet on her own. We might as well make the most of this learning opportunity. Cooperation in reading is especially helpful because children go through periods where they don’t like reading and they resist it. It can be frustrating trying to teach a child to read. Let’s take a look at a child being diapered the RIE way – what do you see? I asked our Montessori and Orton-Gillingham certified Primary Director to identify some skills sets which helped her facilitate the reading program for our preschool and Kindergarten aged children. Her list includes: understanding of relationships (what goes together), motivation, focused attention span, visual ability and tracking, persistence, patience, delayed gratification, and normally developed spoken language skills. These same skills sets can be involved when diapering the RIE way- attributes essential for early literacy. We think so.